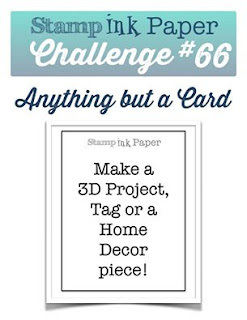 Welcome to the Tuesday challenge at Stamp Ink Paper. 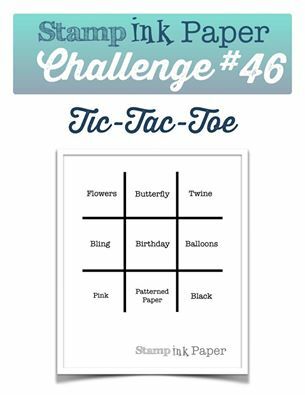 This week its Tic Tac Toe. Choose a line and make your project in accordance. I've used the middle vertical line - Butterfly, Birthday, Patterned paper. Here's my card using a combination of current SU products and alternative branded products from my stash. The SU card and colours used is Whisper White, Elegant Eggplant and Perfect Plum card and tools - The Scallop Edge border punch (retired) and the Butterfly thinlits (white one). I do love this Tinkerbell paper on the background which was part of my stash from the days when I taught card classes in a Scrapbooking store, and yes the butterfly die cut out from Bling cardstock is also from those days. Don't ask me what brand it is. I can't remember. I did use Stampin Up greetings cut with the bitty banners for this card. We look forward to seeing your creation at the Stamp Ink Paper challenge. Have a great day. Your card caught my eye in the Challenge post. Striking! Thanks very much Susan, I love that buttterfly.